Hi Verve fans! After what seems like a month long winter storm here in Idaho, I felt the need for a little something fresh and fun. A friend invited me to a Facebook acts of kindness event the other day to combat all the negativity surrounding the presidential inauguration. It got me thinking of what I could do holed up in my little ice land with two sick kiddos and a bad case of bronchitis. And then it hit me that I could design another digital set. So I did. Feel free to download and shine a little love on the world. If you share your creations online please credit Verve Stamps and use @vervestamps on Instagram and Facebook. And for a little more fun, link up your lovely creations using this set below for a chance to win a $40 gift voucher to the Verve store. I'll draw a random winner on February 15. For my card, I printed the pdf of the set, then cut the love with all your heart sentiment with a pierced square die. I colored the heart in with a rainbow of copic markers, then matted with black cardstock. I cut a 2" x 3.75" piece of patterned paper and matted that with black also, adding a die cut from the Scalloped Trim Trio Die Set for a little accent. 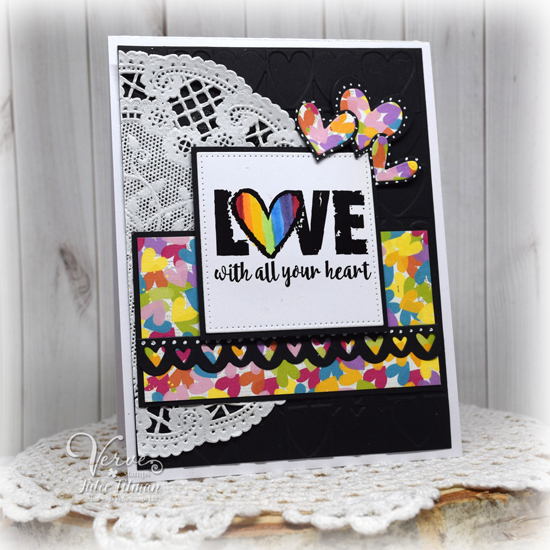 I added the partial doily to black cardstock embossed with hearts, then layered up some hearts using the Heart Quartet Die Set for my embellishment. The layout is this week's Mojo Monday sketch. 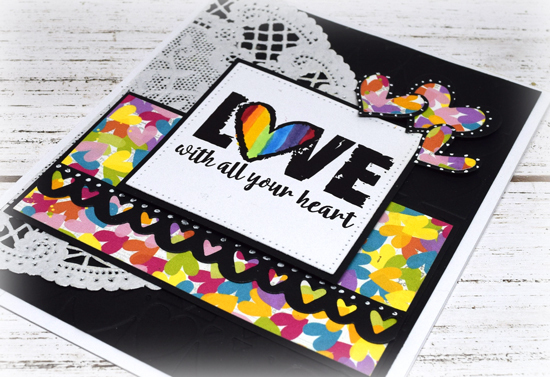 I also made another Mojo Monday card with this printable and the current paper, ribbon and doily free thank you gift from Verve on the card below. Thanks so much for stopping by! I hope you enjoy this little freebie!